A sparkly new promotion has been launched at the South African friendly online casino, White Lotus Casino. In honor of the release of Realtime Gaming’s new Gemtopia video slot game, White Lotus Casino is offering players the chance to claim free spins on this game. 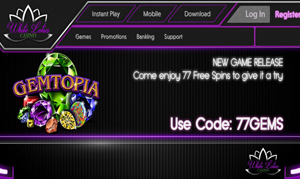 There are 77 free spins on Gemtopia slots up for grabs at this site. “Come and enjoy 77 free spins to give it a try,” welcomes White Lotus Casino. To claim this free spins casino offer, players are encouraged to use the bonus code 77GEMS and the free games will be their’s to claim on the spot. • 5 reel, 15 pay line slot by RTG. • Progressive jackpot with over R4,000 up for grabs right now at White Lotus Casino. • High variance with a return to player percentage of 95.5%. • Different gems on the reels include diamonds, stalagmites and more. • Wager 1 – 5 coins per line. • Wild Gem symbol lands on reels 2, 3 or 4 to replace other symbols except the scatter and bonus icons. • Two scatter symbols are the Bonus Bet Gem and the Free Games Diamond logo. • Free spins are paid from left to right, and from right to left. • If the Wild Gem appears on the reels during the free spins, a respin and expanded wild are awarded. • Win up to 15 free spins. When you join White Lotus Casino for the first time, you will earn a welcome bonus worth R37,500 on your first three deposits. On your second deposit, earn a 250% bonus up to R2,500, using the coupon code SIGNUP250. On the third deposit, earn a 250% bonus up to R10,000, using the coupon code SIGNUP200. Another incredible offer currently running at White Lotus Casino is its 100% cash back bonus of up to R10,000 which can be claimed every day! To qualify for this promotion, players need to make a minimum deposit of R1,000 a day. All players can qualify for this promotion, as long as no other promos have been used with deposits during the time period of the Cashback offer. The promo can be requested once per 24 hour period, and the funds will be credited based on the deposits made by the player during the preceding 24 hours.